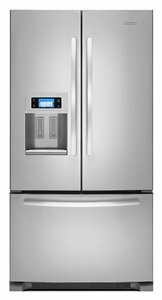 Which Bottom Freezer Refrigerators Are Worth Bending Over Backwards For? Bottom freezer refrigerators are becoming increasingly popular. This is because they conveniently place refrigeration space—which is more frequently used than the freezer space—at the top of the appliance where it is easier to reach. The freezer compartments on refrigerator freezers tend to be larger than their top freezer refrigerators counterparts. As such, they are able to hold more frozen food, enabling you to buy in bulk, save money and time by reducing your trips to the store. French door freezer refrigerators have a refrigerator that is accessed via 2 side by side doors and a pullout freezer drawer that occupies the bottom part of the appliance. Besides being trendy, French doors are space savers as they do not require lots of floor space to open. As such, they add a stylish touch to both small and large kitchens. #1. LG LFX28968ST with a humongous capacity of 27.6 Cu. Ft. It's other benefits is that it has an ice maker and it's Energy Star certified. #2. Whirlpool WRX735SDBM with a capacity of 24.5 Cu. Ft. 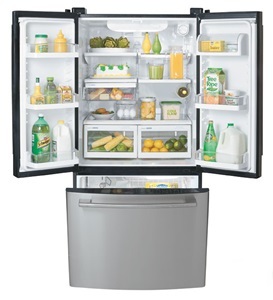 This stainless steel French door model has 2 freezer drawers and an ice maker. #3.Samsung RF28HMEDBSR with a capacity of 28.15 Cu. Ft. It has an ice maker and is an Energy Star. #4. Kenmore Elite 74025 with a capacity of 29.8 Cu.Ft. is the largest of the bestsellers. It has a convenient "Tilt-N-Take" freezer door and an ice maker. Under counter bottom freezers are designed to fit under standard counters. They are a great choice if you want to aesthetically de-emphasize your freezer refrigerator. Or if you need a model that can provide space for your frozen needs without gobbling up your kitchen space. Single door bottom freezer fridges have a single door which serves as the sole access to both the freezer and refrigerator compartments. Each of these compartments is accessed via a dedicated door. Stainless steel bottom freezers come in either a glossy or matted finish that is bound to add a classy touch to any kitchen. Black freezers add a contemporary feel to the kitchen so are a great way to accentuate a modern design theme. This is because leading manufacturer have only started making black appliances over the last few years so they are generally new on the market.